We’re excited to announce that RKA has been awarded the Sustainable Innovation Award in the Sustainable Site category by the Los Angeles Chapter of the U.S. Green Building Council (USGBC-LA) for its creative architectural solutions and restoration work in the adaptive reuse of the historic Ford Factory in downtown Los Angeles, which was completed in March 2017 and achieved LEED® Gold certification. Each year, the USGBC-LA recognizes project teams who exemplify having a commitment to a sustainable built environment, and who reflect the Chapter’s focus on energy and water savings, air quality, good design, community engagement and equity. The original concrete and brick building was one of six factories designed by Parkinson & Bergstrom and built by the Ford Motor Company to assemble Model A and Model T automobiles from 1913 to 1929. The site consists of a five-story factory (Tower) built in 1913, a two-story factory (Assembly Plant) built in 1923, a single-story storage facility (Annex) built in 1984, and a cold storage facility built in 1996 (and then demolished in 2015 to make room for the Paseo and parking structure). Rockefeller Kempel Architects was careful to protect the history of the structures and restore character to the decaying buildings while modernizing the site for future use. · The beautiful façade was restored to its former glory by revealing the historic brick and displaying the original expanse of glass. · The original mushroom column capitals in the Tower building, which can be seen today in a restored fashion, support the extremely thick floor plates that once held the machinery used to build the original Ford automobiles. · The clerestories in the Assembly Plant and Tower building were given new life while still meeting strict LEED and Title 24 standards. These gigantic linear skylights bring abundant natural light into the workplace, not only cutting down on the need for artificial lighting, but adding to the healthy atmosphere that natural light provides. · 83% of the existing structure and envelope elements like the steel window frames and skylights were used in the redevelopment. 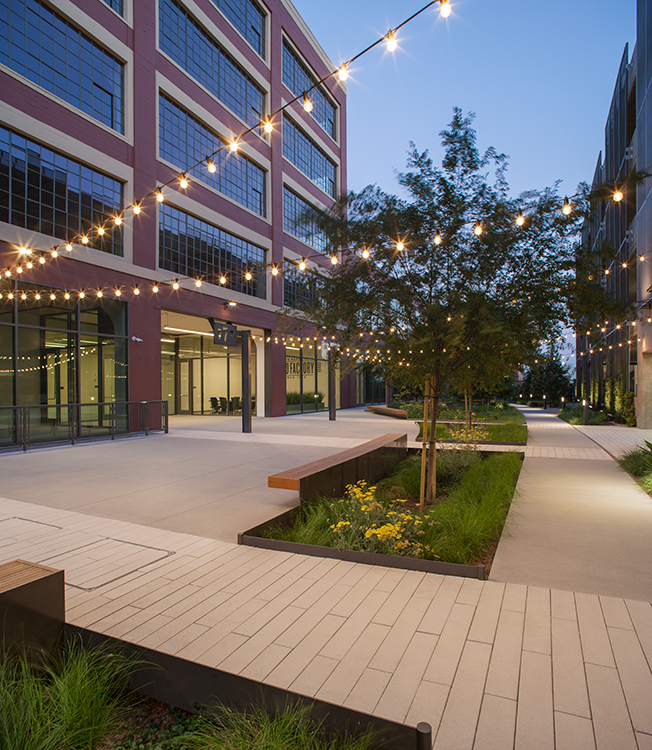 · A 15,000 square foot linear park or Paseo was added as a communal space between the office and the new parking structure. It provides shade, landscaped views, and an escape from the urban surroundings while welcoming visitors to the site and serving as a delineation between the structures.